The Burke-Gilman Trail runs primarily along a disused railroad alignment in and around Seattle, Washington. 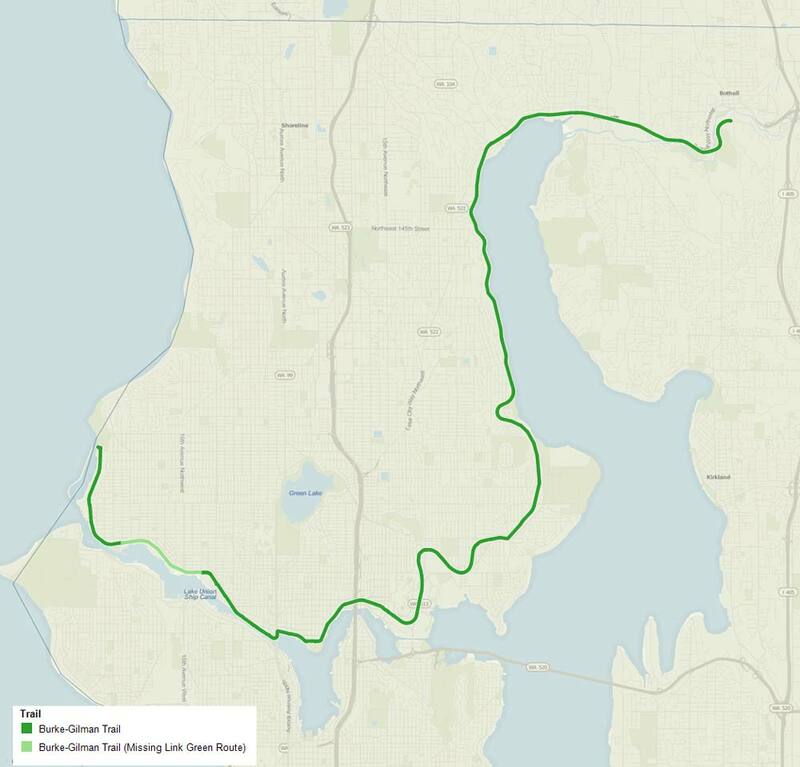 It winds for 27 miles through King County, and was originally owned by the Seattle, Lake Shore and Eastern Railway. The trail runs along Lake Washington and its associated Ship Canal, before running through Marymoor Park to Issaquah. A section of the trail through Ballard is missing, although construction of this has been proposed in order to fill in the “missing link” of the trail. The Seattle, Lake Shore and Eastern Railway company was founded in 1885 by Daniel Gilman and Thomas Burke, together with their associates. It was briefly operated by the Burlington Northern Railroad from 1970, but the line was abandoned the following year. The idea to transform the unused tracks into a rail trail came fairly quickly, with the first portion of the trail opening in 1978. This ran for just over 12 miles, starting at Gas Works Park in Seattle and ending at Tracy Owen Station in Kenmore. Over the following years, several incremental extensions were made to the trail. By the 21st century, extensions to the Burke-Gilman Trail existed at its western and northern extremities. In the latter case, the extension runs from Shilshole Bay to Golden Gardens Park, while the western extension covers the 11th Avenue area. There is also now a railroad exhibition – the Northwest Railway Museum – near Snoqualmie Falls. The gap in the current trail is centered near the waterfront at Salmon Bay. This remains a heavily industrialized area, and one of the reasons for the lack of progress in adding this “missing link” to the trail has been concern for the safety of walkers and cyclists in a place still used by trucks and trains. Existing areas of the trail can become congested at peak times, but most citizens’ groups, as well as the City of Seattle itself, are strongly in favor of the completion of the trail. Some of them suggest that the safety warnings given out by business leaders are excessively alarmist and not justified by the facts on the ground. They also point out that, when it is necessary to undertake extensive construction work, the necessary powers already exist to close specific parts of the trail to the public. This most recently occurred in 2011, when a two-mile stretch within Lake Forest Park was closed for several months to enable redevelopment work to take place. Most of the trail is off-road, although there is one significant on-road section in Ballard itself. 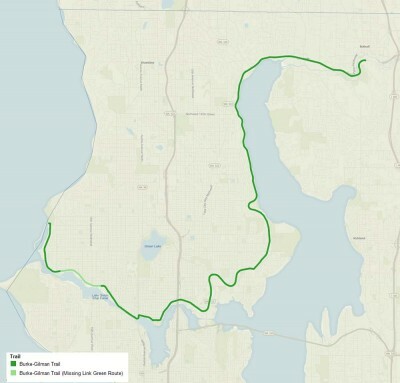 King County and Seattle have designated the trail as part of what they refer to as the “Locks to Lakes Corridor.” Management of the trail is the responsibility of the City of Seattle within its city limits, whereas beyond Northeast 145th Street King County takes over. Largely because of its mostly off-road nature and good management, the Burke-Gillman Trail has become extremely popular with a wide range of leisure users, including joggers, skaters, and cyclists. It is also used for cycle commuters traveling between the Eastside and Seattle itself. There are several landscaped viewpoints with vistas across Lake Union and the greater Seattle neighborhood.